3ds max, render, tea, oil, cheese, lighting, realistic, realism, shadows, maps, shadow maps, raytracing, raytraced, colourless, pale, plastic, imperfection, perfection. 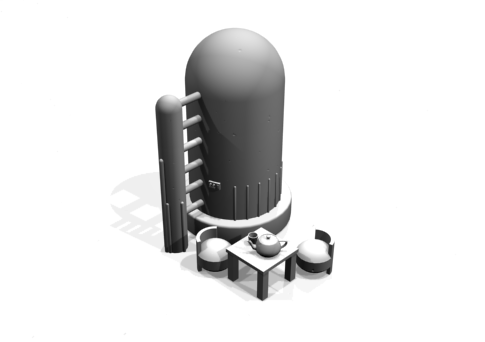 A tea party scene, with a difference... backed by an oil storage unit. Or something. This 3D render is the acomplishment of an idea I've had for a while now. I spent ages on the lighting, creating a bright scene, with vague shadows. I wanted soft, blurry shadows, but couldn't find the right options. I went with 5 scene lights, 3 providing all round illumination, 1 vertical spot light facing straight down, and a 5th offset shadow up top right from the camera. The result is a semi-realistic scene, that looks more detailed and alive then a basic render. Adding detail to the scene created extra depth to the objects, providing minor shading to the different elements. I especially like the designer chairs around the table; so simple to put together, and so appealing... I want one for my room! Maybe in blue tho, not white.